Kansas Sailing Association is dedicated to one design racing. 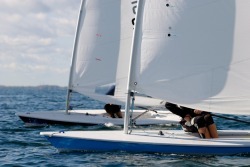 One design racing is where everyone competes in the same type of boat. At KSA, we currently support five fleets made up of Thistles, Flying Scotts, Lasers, Optimists and a fleet of catamarans. Each fleet gets their own start and compete in a true "head to head" competition. The boat that wins the race, was the better sailor (at least in that race!) since everyone has the same type of boat, number of sails, etc. Below you will find a link to our current racing schedules. Racing starts at 1PM. Plan to be in the water about one hour before race time to make the start.